Charis’ latest time paradox has left Christina staggering. The history of Meric is being unraveled right before her eyes. While some unimaginable questions are being answered, even more questions start to creep up. Will they make it out of this place alive? Will they make it back in Meric in time to stop Leticia and save their friends? Will Christina and Shaw ever be married? Will Rayliex, with all his powers, join their side? Only time holds the answers to these questions. Considering Christina isn’t even in her own time, she’s not so sure anymore. One thing is for certain; no one could have ever guessed that Meric’s origins would have been in this place. Christina is once again stunned to find herself in a different time, but this time she’s not alone. Shaw and her brother are transported alongside her to an unknown time in a mysteriously high tech underground fortress. Fearful and confused as to why the Creator brought them there, they seek to find answers. Are they finally discovering the true origins of Meric? Will they return to the present in time to save their friends left behind? And will Christina and Shaw ever get married? 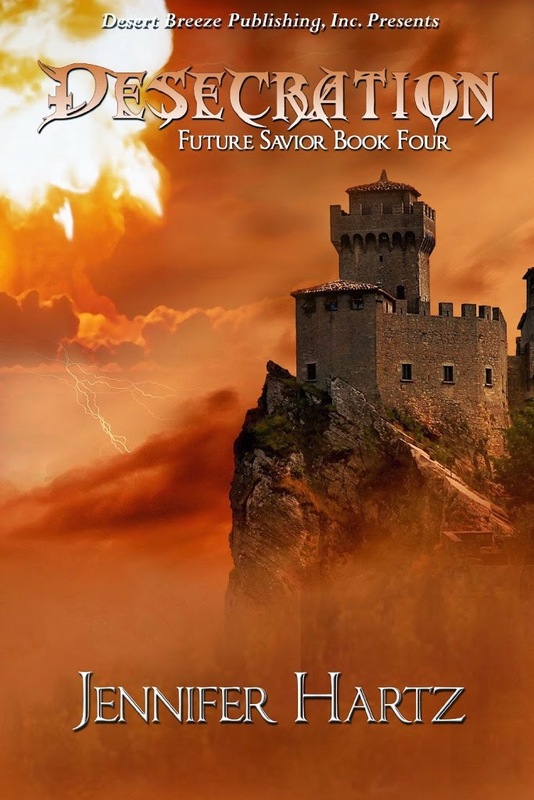 In the fourth installment of The Future Savior series, Jennifer Hartz manages to completely astonish her readers once again by revealing what we have been waiting for since book one of the series— the complete story behind Meric. Not only did this story completely surprise me, it also went above and beyond anything I could of ever imagined. When you are beginning a new enjoyable series, all you can ever really hope for is that the next book lives up to the previous ones. I thought book two couldn’t possibly get any better than the first, but I was wrong. Same with three and now with this fourth one! The twists and turns constantly presented managed to mesmerize me page after page in every single book, but it was Desecration in particular that amazed me the most and it is Desecration that took this series to a whole other level. This book gives an entirely new meaning to the word “epic”! In addition to the crazy twists and turns, there was so much revealed in this book that it made my head spin at times. I was SO happy to learn more about Meric, Christina, Shaw, her brother, and the rest of the gang. The character development was very impressive— if you thought the previous books told all there was to tell, think again! The writing style is all encompassing— I don’t know how else to explain it other than it truly transported you into the character’s lives. I loved to see all that I particularly enjoyed about the previous books still included in this one, such as the Biblical mirrors. It was so much fun to recognize these sub-plot stories. Desecration was a satisfying and stunning continuation of this much loved series. I am beyond excited to read the conclusion, Revelation. Though truthfully it’s also bittersweet, because I really don’t want it to end. Nonetheless, I doubt I will be able to pace myself and savor the conclusion…I am way too eager to see what happens! *This book has mature content and I don’t recommend it for younger readers. **I received this book from the author in exchange for my honest review. All thoughts are completely my own.